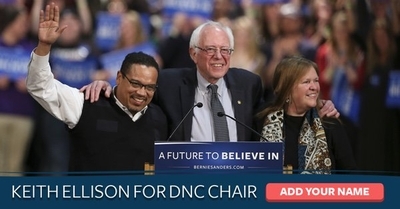 U.S. Rep. Keith Ellison's announcement earlier this month that he wants to be the Democratic National Committee's next chairman drew quick support from several key lawmakers, including Jewish senators Chuck Schumer and Bernie Sanders. Ellison backers also have defended him against claims he may hold anti-Semitic views in addition to being anti-Israel. A column in Israel's liberal daily Haaretz quotes two rabbis praising Ellison, D-Minn., as "the best of our constitutional democracy and the best of America" and "an extraordinary leader. Anyone who would associate him with any kind of hatred hasn't met him and certainly hasn't worked with him." "The United States foreign policy in the Middle East is governed by what is good or bad through a country of 7 million people. A region of 350 million all turns on a country of 7 million. Does that make sense? Is that logic? Right? When the Americans who trace their roots back to those 350 million get involved, everything changes. Can I say that again?" The fundraiser for Ellison's re-election campaign was hosted by Esam Omeish, a past president of the Muslim American Society (MAS) who was forced to resign from a Virginia state immigration panel in 2007 after an exclusive IPT videotape showed him praising Palestinians for choosing the "the jihad way ... to liberate your land." Omeish was a candidate for Virginia's general assembly the previous year, and Ellison spoke at a fundraiser for that losing effort. In his 2010 remarks, he described Omeish as "my beloved brother and I love you and you are the best and your family is so beautiful and again, you know, you put it out there. You ran. And I hope you run again." Also present at the fundraiser was Nihad Awad, a co-founder and executive director of the Council on American-Islamic Relations (CAIR), and a member of a Muslim Brotherhood-created Hamas support network in America known as the Palestine Committee. Ellison's comments about Israeli political influence do not appear to be a poor choice of words. A year earlier, as conflict raged between Israel and Hamas in Gaza, Ellison told Al Jazeera that "the people who have a strong sympathy for the Israeli position dominate the conversation. It is really not politically safe to say there have been two sides to this." A month later, Ellison told the BBC that outreach to Hamas was not feasible for a member of Congress – not because it is a terrorist organization with an anti-Semitic charter demanding Israel's destruction – but because it is too politically risky. "What I can tell you now is that the constellation of political forces in the United States at this moment would make a member of Congress who has reached out directly to Hamas spend all their time defending that decision and would not be able to deal with other critical issues that need to be focused on. So for example if I were to make a move like that I wouldn't be able to focus my attention on the humanitarian issue. I'd have to defend myself to my colleagues why I reached out to a terrorist organization. It would absorb all of my time. I would spend a lot of time fighting off personal attack and would not be able to achieve goals that I have." Just after the 2009 Gaza war, Ellison was among 22 House members to vote "present" rather than take a stand on a nonbinding House resolution "recognizing Israel's right to defend itself against attacks from Gaza, reaffirming the United States' strong support for Israel, and supporting the Israeli-Palestinian peace process. Ellison claimed he was "torn" on the issue because it "barely mentions the human suffering of the Palestinians in Gaza." Ellison long has demanded that Israel open its borders to Gaza, arguing that economic aid and development would help ease tensions and resulting violence. In 2010, he authored a letter signed by 53 House colleagues which called on President Obama to pressure Israel into opening the border. Ellison described the blockade as "collective punishment" on Gaza residents. He re-upped the argument in a 2014 Washington Post oped which was written during new conflict between Israel and Hamas. Hamas terrorists provoked the war by kidnapping and murdering three teenagers and by launching thousands of rockets at Israeli civilian areas. But Ellison argued that peace would come with economic relief in Gaza and said an end to the blockade should be part of any ceasefire. "The status quo for ordinary Gazans is a continuation of no jobs and no freedom," he wrote. "This is not an attractive future. Gazans want and deserve the dignity of economic opportunity and freedom to move." The restrictions on imports to Gaza were aimed at curbing the flow of materials sent to Hamas to build rockets, bombs and other tools for terrorism. Israel allows humanitarian aid into the territory. But Hamas continues to divert millions of dollars in aid and supplies which could be used to improve daily life in order to dig more attack tunnels and restock its terrorist arsenal. While he also said that "Hamas must give up its rockets and other weapons" to achieve peace, Ellison was one of only eight House members to vote against increasing funding for Israel to provide added funding for Israel's Iron Dome missile defense program. Even though it successfully intercepted dozens of Hamas rockets, especially those aimed at population centers, Ellison said the proposal was no good because "the US government needs to be prioritizing a ceasefire between the two sides." These statements and countless others should concern DNC officials before choosing a leader early next year. Any chairperson's job will include efforts to preserve and maintain the party's support from American Jews. Exit polling indicates an estimated 71 percent of Jewish voters supported Hillary Clinton's candidacy. Jewish leaders either don't know the extent of Ellison's relationship with Islamist groups like CAIR, or of his consistent criticism of Israeli actions, especially in response to Hamas terror, or they do not care. Jonathan Greenblatt, the Anti-Defamation League's chief executive, issued a statement last week saying Ellison "is a man of good character" and "an important ally in the fight against anti-Semitism and for civil rights." As we have shown, he's also a man who believes Jewish interests disproportionately influence American foreign policy. During last summer's national convention, Ellison and other delegates supporting Sanders wanted the Democratic Party platform to delete a description of Jerusalem as Israel's "undivided capital" and wanted to gut language opposing the boycott, divestment and sanctions movement targeting the Jewish state. Those efforts were pushed back, but should have a far stronger position under an Ellison-run DNC. In addition to seeing Israel as controlling government policy, Ellison has supported prominent Islamists targeted for their direct support for Palestinian terrorist organizations. During a 2008 radio interview, Ellison praised Sami Al-Arian. Years earlier, evidence admitted into a federal court showed Al-Arian served on the Palestinian Islamic Jihad's Shura council, in essence, its board of directors. Despite that fact, Ellison said he wished "that Dr. Al-Arian and his family have peace, have justice, and are able to secure a greater quality of justice for their case," saying he found "some things about his case that I think raise legitimate questions." Similarly, Ellison expressed frustration at the 2007 terrorist financing trial of the Holy Land Foundation for Relief and Development and five former officials. The charity, shut down by the U.S. Treasury Department in 2001, funneled millions of dollars to Hamas through a network of Palestinian charities the terrorist group controlled. But after a trial ended with a hung jury on most counts, Ellison blasted the case as "persecution" during remarks at a CAIR fundraising banquet in Anaheim. CAIR was named an unindicted co-conspirator in the case, in part due to internal Palestine Committee documents showing CAIR was part of the Muslim Brotherhood's U.S. network from the moment of its 1994 inception. "And the worst of it was not that these people's lives were disrupted, their reputations were tarnished," Ellison said. "The worst of it was that  other organizations were tossed in to the mix of it all as they were listed as unindicted co-conspirators. No evidence to be found that they had done anything. So here is what we have today. 300 reputable civil rights organizations, including CAIR, put on a list they never should have been put on in a case where they had been thoroughly exonerated. It's time to call an end to wasting taxpayer money in this manner. There have been other prosecutions for Muslim charities and we've come up with nothing at all when it comes to convictions in these cases. It's time for us to call a stop to this selective prosecution. It's time to say that our justice system and our prosecutors and our police officers are here to investigate crime for the sake of public safety, not to pursue a political agenda." The Holy Land defendants were retried in 2008, with jurors convicting the defendants on all counts. Ellison did not comment. In 2009, Ellison made the pilgrimage to Mecca known as the Hajj. His travels were financed by the Muslim American Society (MAS), which insiders have acknowledged is the Muslim Brotherhood's overt arm in the United States. When it comes to Muslims who may not share the Islamist ideology of MAS, CAIR and others, Ellison is quick tempered and hostile. He walked out of a 2009 Capitol Hill panel discussion with Zuhdi Jasser, founder of the American Islamic Forum for Democracy, after falsely accusing Jasser of giving "people license for bigotry," and "to engage in nothing less than Muslim-hating." Jasser's "sin" was to criticize the Muslim Brotherhood in Egypt and advocate for "a separation between mosque and state." Similarly, Ellison dramatically lashed out during a 2011 House hearing on Islamic radicalization. Even though the panel included a Muslim father of an American who became a terrorist, Ellison fought back tears talking about a Muslim first responder killed at the World Trade Center on 9/11. Simply holding the hearing was tantamount to assigning blame for a terrorist's "violent actions to the entire community," he said, "you assign collective blame to the entire group." Ellison has spoken at at least a dozen CAIR fundraising events since 2006, records show. In addition, the IPT has learned that Ellison privately consults with CAIR for talking points and suggestions about pending actions and hearings before the House. It's little wonder that, in 2014, CAIR honored Ellison with its "Muslim of the Year" award. Jasser recently devoted his weekly podcast to Ellison's DNC candidacy. "A DNC run by a Congressman Ellison, I think, will become very dangerous," Jasser said. That's in part due to Ellison's support for Saudi Arabia, despite that country's strict Wahhabi ideology and its prominent role financing the spread of a radical interpretation of Islam globally. Ellison also is a frequent fundraiser for CAIR and is supportive of the Organization of Islamic Cooperation, an umbrella group for 57 majority-Muslim nations which wants to see global blasphemy laws outlawing criticism of religion. Ellison "racializes" Islam, Jasser said, as part of a broader reliance on identity politics. "Islam is not a race. It's an idea. An idea, by the way, that includes ideas loathe to the Democratic Party" such as severe restrictions on women and the death penalty for homosexuality. But by making criticism of Islam, or of those who want to apply it politically, critics can be dismissed as bigots. He recounted his 2009 debate with Ellison and the 2011 radicalization hearing in which Ellison engaged in "character assassination of us as witnesses. And the fact that we were Muslim did not seem to matter to him." That is one point on which Jasser and Ellison agree. Two weeks after the hearing, Ellison spoke at a University of Michigan-Dearborn event sponsored by the school's Muslim Students Association (MSA) chapter. Like CAIR, MAS and the Islamic Society of North America (ISNA), the MSA was founded by Muslim Brotherhood members in the United States. Internal records show the Brotherhood acknowledges the connection. Ellison dismissed Jasser, who advocates reform and opposes mixing his faith with government policy, and Abdirizak Bihi, the uncle of a radicalized Somali American from the Minneapolis area who died after joining the al-Shabaab terrorist group, as "some Muslim guys who, you know, who basically are angry at their community to go say a bunch of anecdotal things about ... how good they are and how bad we are." Ellison's record is clear. He raises money for some of the country's most deceptive Islamist groups and works with them to advance their causes. He singles out Israel for criticism and believes the Jewish state enjoys disproportionate control over American foreign policy. He wants to lead one of America's two major political parties.